The hotel offers 50 well-equipped rooms which come with air conditioning, satellite TV offering both French and international channels, and free Wi-Fi internet access. The Balladins Confort, perfect for stopovers and short business trips, is ideally situated 5 minutes from the Eurexpo exhibition centre, 10 minutes from the centre of Lyon and 15 minutes from the international airport Lyon Saint Exupéry. Additional facilities include a bar with a terrace and private parking with surveillance cameras. There is a choice of nearby restaurants. Reception is open every day from 7:00 to 23:00. After 23:00 an automatic terminal allows customers holding reservations to retrieve their key. Follow the A43, exit Porte des Alpes/ST Exupéry. From the A6: East ring-road Grenoble/Chambéry, follow a43 for Lyon Bron/Porte des Alpes/St Exupéry. From A43: Grenoble/Chambéry. Exit Porte des Alpes/St Exupéry. 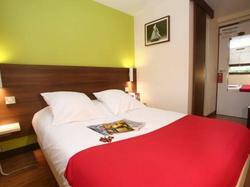 Free Wi-Fi access and satellite TV feature in this air-conditioned, en suite room.